"Mold Garden" is a very simple microbiology primer for early grades. It's easy enough to turn it into a high quality and moderate complexity science fair projects for grades 5 to 8. Mold is fungi - kingdom of life completely different from plants or animals. Fungi can't produce organic compounds and energy from the sun light and air like plants. They can not actively move and search for food. Fungi play important role in decomposition of organic remains on our planet. 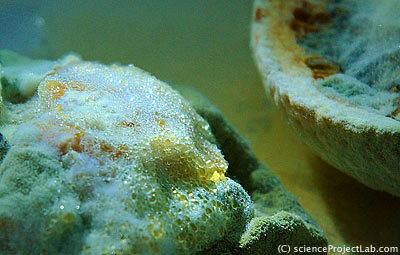 They can live on pretty much any substrate and also can infect living organisms. They also can cause allergies, which means you should be careful working with them. Fungi reproduce very fast producing billions of spores. Fortunately only tiny fraction of spores survive. If spore gets in the place with suitable conditions mold spore grow very fast and produce microscopic threads called hyphae which builds fungi body or mycelium. Mycelium soon starts producing more spores. Mycelium usually does't have a color but spores can have very different colors - gray, orange, yellow, black, green, etc. Other fungi such as single cell yeasts or edible mushrooms may reproduce in slightly different way but all of them produce spores. 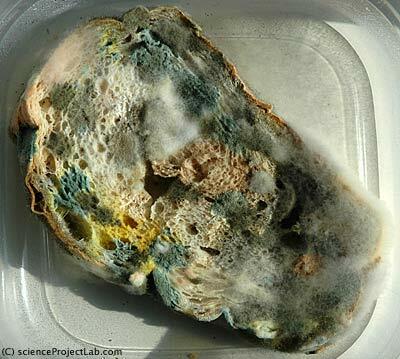 Simple Bread Mold Science Project. The goal of this project is to grow different mold species on different kind of substrates to find out if the same bread mold species will grow on all of them. Do all mold species have the same taste and preferences?! A few transparent plastic containers. Different kind of food - fruits, bakery, vegetables, chips will work well. Do not try to grow mold on meat. Mold is mostly vegetarian. In our test case we used orange, kiwi fruit, cabbage leaf, bread and biscuits. Bread is well known favorite mold food, everyone know that. We wanted to check if the bread mold will like biscuits - they made from the similar products they also have sugar which should be great food for the mold. Our other substrates are fruits and vegetables. Fruits have a lot of moisture and sugar which should be good for the mold, cabbage has moist leaves. We did't use any meat because it contains a lot of protein. Bacteria will grow fast on protein causing extremely bad smell of decomposing meat. Put your samples in the containers and cower with lids. Leave in the dark warm place. Check every day for the mold growth. Write down any changes that you notice during your observations. 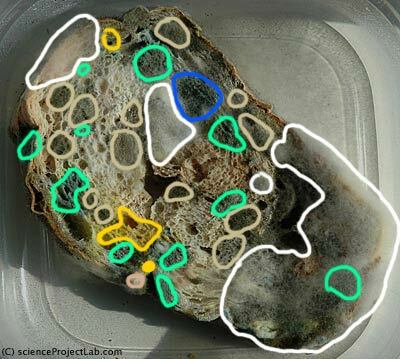 Try to count mold colonies, describe their shape and color, what happens to them as they grow. Our substrates. Bon appetite, mold. We put our substrate samples in 4 plastic containers and sprinkled it with water. Air always contains microscopic dust particles. Some of this particles are mold spores, some are soil particles that also can contain mold spores. Air current moves the particles from place to place and this is how mold spread. When such particles land on our wet substrate they will stick to it and (hopefully) contaminate it with spores. We have left our samples open for 30 minutes. Some mold spores already existed on the fruits but we needed to let some spores land on the fresh cut of bread and fruits. Biscuits also needed some exposure to the open air. After half of hour of exposure we closed containers with lids and put it in a warm dark place. If you repeating this experiment, make sure that container lid closed tightly. If you want to open it to check the mold do it EXTREMELY carefully. Mold spores lift off with the smallest breath and heavily contaminate your environment. You don't want to get sick or get an allergy! After inspection close container tightly. When experiment finished, Put containers in the plastic bag and dispose it. Do not open the lids. Do not try to wash the containers. Next few days we were checking them for the signs of mold. After one week of incubation we've got plenty of it! Look at the following pictures. Bread produced the biggest amount of mold colonies of the different species (Fig. 1). Some of the colonies belong to the same species. We can not tell scientific names because with mold you need microscopic study to do that accurately, but we can tell that we have at least 5 species in multiple colonies (Fig. 2). We outlined the biggest colonies for each species. White fluffy cotton-like bread mold grows faster then others and very aggressive. It can consume other colonies but it does not seem to produce a lot of spores. The other main 2 mold species are green and yellow-gray. There are also few small colonies of bright yellow color. This type of colony grew only on the bread sample. Many colonies joined, some colonies are consumed by other and it's hard to count their exact number and accurately calculate how many spores contaminated the bread. However there are more then 30 colonies growing on this sample. Fig. 2: Bread mold colonies outline. The kiwi fruit shows very different growth pattern. On the cut surface we can see 2 dominating colonies - green and yellow and few other smaller colonies. The surface of the skin is pretty tough and almost not affected by mold. 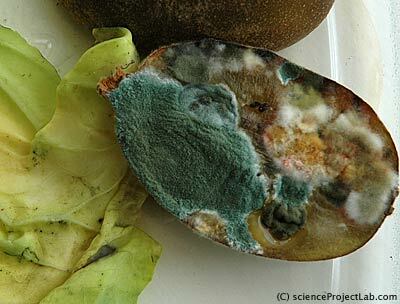 The most successful species that grew on kiwi fruit was "green mold". The cabbage resists to the mold grows very well - no sign of mold so far. Unlike Kiwi fruit, orange skin shows heavy mold grows and the cut is less affected. It looks like mold does not like orange juice! Fig. 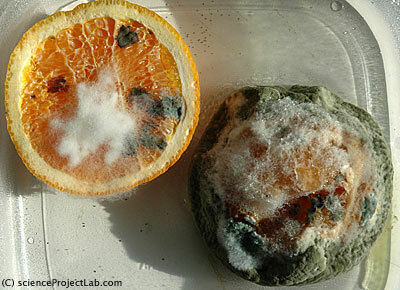 4: Mold on the orange. Biscuits did not show any mold grows at all even in 3 week time! Observing mold growth we can tell that different kinds of mold grow better on different substrates. The speed of the grows depends on the moisture, amount of nutrients and resistance of the substrate. Biscuits - the most dry substrate which also contain anti-mold preservatives did not show any growth. Cabbage leaf show the best resistance to the mold growth among the other tested substrates. Do you have mold in your room? No? Let's find out. prepare sterile substrate for the mold growth. Try to find out how many mold spores per hour lands on 1 square meter of the surface in your room. For this project you'll need to learn how to prepare "medium" - sterile nutrient substrate made specifically to grow microorganisms such as mold or bacteria. 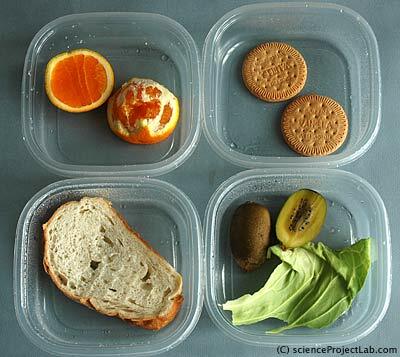 You can make it yourself or buy reedy-to-go sterile petri dishes. Home-made media could be prepared from different components. Different type of microorganisms prefer different media. Mold media can be prepared from potato, banana, starch, oatmeal and cornmeal and even such exotic thing as rabbit dung. Starch/gelatin or starch/agar medium is the simplest that you can do at home. Plastic containers similar to what we used in the mold garden project will serve as a big petri dish. Prepare sterile medium and pour it into 4 containers. Close containers and wait until medium is set. Open container lids and close them one at a time each 5 minutes so that you have container that was open 5min another one 10 min, etc. Wait a few days and calculate mold colonies on the medium. isolate individual mold species from environment (air, soil, water) and grow a clean strains of mold. Inoculate medium in petri dish with different mold species and find which species will win the fight for resources. When you have multiple colonies that grew from the spores on sterile substrate you can try to grow a clean line - individual species of mold and compare some of their qualities - such as growth rate, "aggressiveness", tolerance to the different substances, light, etc. To do this project you 'll need to learn how to do sterile transfer of the mold spores, and experiment with different cultures.